Tony Ortega wrote an article in February that outlined Ross Blocher and Carrie Poppy who explore fringe beliefs and pseudoscience by experiencing it for themselves. These two gutsy journalists made an 8-part podcast series about their investigations and adventures while checking out the Church of Scientology. They start with taking a personality test (February 2016) and get up to the purification rundown (May 2016). This is an excellent 8 part podcast series and so worth listening to whether you are an ex-scientologist, a never-in, or scientology watcher. 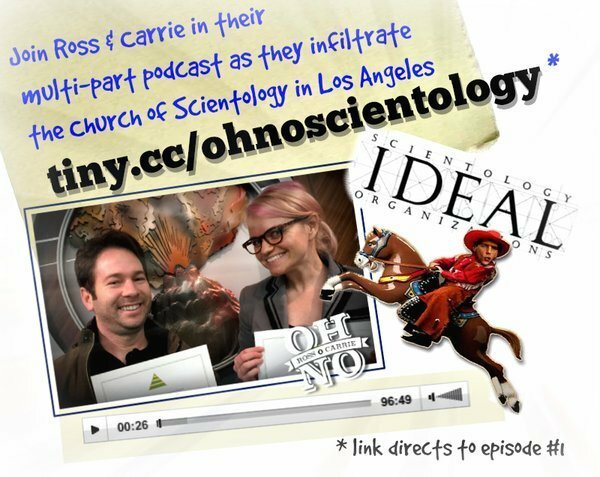 The "fun" continues as Ross and Carrie get certified in Dianetics. The pair spend 22 hours at the Church over a single weekend, learning how experiences are encoded in our cells, what an "engram" is, and how to audit your friends for neither fun, nor profit. Plus, find out the secret menu item for Scientologist vegetarians. Join Ross and Carrie on a visit to the L. Ron Hubbard Life Exhibition. Let your eyes widen as you hear the various questionable biographical details of the founder's life, from being the youngest-ever Eagle Scout to performing microbiological studies... by himself. Plus, Carrie tests the e-meter, Ross recounts a previous visit where he was ejected from the building, and we review the official Scientology literature on the controversial practice of "disconnecting" from loved ones who question the Church. Thanks, aegerprimo for keeping us up to date on this great series of podcasts. I heard there will be a Part 9. I will post it as soon as it is released. Ross and Carrie are probably about to be ejected in the next episode. It's too bad that scientology can't stand up to any level of scrutiny.